The other day, President Obama, in stage-managed exasperation about the Deep Horizon oil leak, demanded that BP "plug the damn hole." Welcome to our World, Mr. President. Obama and the Democrats pass an eight-hundred billion dollar "stimulus" package, that stimulates nothing, but explodes the federal budget deficit. Americans at Town Hall Meetings and Tea Parties demand, "plug the damn hole," but Obama impassively lectures us on how his "stimulus" has brought America's economy back from the brink. The U.S. economy is hemorraging jobs, with 10% of the workforce unemployed, and Public Opinion Polls scream, "plug the damn hole," but Obama instead devotes his attention and political capital to a government take-over of our healthcare system. The Southwest border states are overrun with illegal immigrants crossing the Mexican border, so the People of Arizona pass a law to "plug the damn hole," and Obama's response is to slander Arizonans as racists, and nod in agreement as the President of Mexico insults American Patriots, all the while continuing his refusal to enforce our national border. So, after a mere seven weeks of oil spouting into the Gulf of Mexico, Obama thinks he's frustrated. For 16 months Americans have been demanding that Obama "plug the damn holes" but he just keeps making them bigger. What is the dividing line between Conservatives and everyone else in America today? Limited –vs- Unlimited Government. We have the Constitution limiting the consent of the governed, rather than the Constitution limiting the scope of the government. This turns the framers’ intent on its head. Protests in Arizona, by advocates of illegal immigration. Would these represent the kind of seditious, anti-government sentiment that Liberals were warning of earlier this month, when the Tea Party protests were happening, or should we, in this case, try to "understand their rage"? Did you miss the investigative reports? This must have been a grassroots collection of ordinary citizens from all walks of life, because news consumers were not treated to weeks of reporting and analysis of the participants' racial composition, income-level, education or political party affiliation. We were not introduced to any slang terms for perverted sexual acts, applied to the protestors by network news broadcasters, nor were we regaled with ominous hints about the propensity of such dissenters to commit acts of anti-government violence, accompanied by stock footage of carnage from The Unabomber's handiwork. News reports of the rally did give passing mention to the presumably innocuous fact that the crowd included "public employees, labor union members and school teachers," so permit me to translate: this astroturf rent-a-mob consisted of a bunch of parasites, angered that the Democrats in Springfield have thus far failed to hike the rate at which they rob the productive private sector through taxation, in order to adequately suckle the unproductive sector, as represented by public employees, labor unions and school teachers. Now, not being a Stalinist thug myself, and therefore unqualified for employment in the "mainstream" media or the Obama administration, I am perfectly content for this brood of blood-sucking parasites to skip work in order to clamour outside the State Capitol for policies that they support. I merely note, for the record, the double-standard of media scrutiny compared with the Tea Parties. My niece recently asked me what books she should read to become a well-read person. Here's the list I gave her, off the top of my head. The Blackford Oakes Novels – William F. Buckley Jr. The Fall of the Berlin Wall – William F. Buckley Jr.
Up From Liberalism – William F. Buckley Jr. The Daily Herald ran a priceless headline, "FBI Arrests Christian Militia," over its copy & paste of the Associated Press story identifying arrested militia members as "Christian" and "Right-Wing." I'm not quite sure what makes these particular militia-ists "Right-Wing" -- perhaps they favor cutting the federal budget, reducing marginal income-tax rates, or drilling in ANWR -- but the willingness of AP and The Daily Herald to label them as "Christian" reveals a transparent double standard that says more about the weasels in the news media, than it does about militiamen, Christian or otherwise. When Muslim terrorists, open fire, torch cars, or blow up innocent civilians, while shouting "Allahu Akbar" AP routinely treats us to tortured euphemisms like "alleged gunmen," or "extremists," even though the perpetrators self-identify as adherents of Islam, quote from Islam's holy book, and are acknowledged as legitimate by vast numbers of Muslim leaders and followers. For some reason, AP, Rueters, and the news reports that parrot them, can't bring themselves to use the "M" Word. But, AP has no such compunction when it comes to labeling militia wackos as "Christian." Certainly, these militia self-identify as Christians and quote from Christianity's holy book, but can any investigative reporter locate any significant support from Christian leaders and followers? Any prominent Christian to give credit to this militia's doctrines? To ask those questions is to answer them. I heard a man on the news, who compared the passage of the Democrats' healthcare takeover to "Christmas Morning." That's really not too far from the truth. What do so many people do between Thanksgiving and Christmas? They run up massive credit card charges so that Christmas Morning has a heap of goodies under the tree. Then Christmas is over. Then comes January, and the bills arrive. Then comes the sick feeling in the pit of your stomach, and the remorseful questions, "what have I done?" "why did I do it?" Well, that's what Obamacare will be like for that man on the news report, but to most Americans it will be slightly different. We didn't run up our own credit cards. Barack Obama, Nancy Pelosi, Harry Reid, and your Democrat U.S. Senator and Representative ran them up for us. Christmas will be over soon. The bills are in the mail. Merry Christmas...or not. Democrats have rammed through a government takeover of American health care. What now? National Review Online's editorial aptly begins with the words, "Nil Desperandum," and that is the right attitude for Americans distressed by this unprecedented inroad on the private sector. David Horowitz likes to say that "in politics, there are no lost causes, because there are no won causes." But, much will depend on the intrepidity of Republican legislators and candidates -- isn't that a scary thought? -- who are America's last best hope to repeal Obamacare. Is there a Republican leader out there who can lead this fight? Paul Ryan, perhaps? Ultimately, however, the American People will decide at the ballot box whether to restore Constitutionally limited government, or accept the new order. Will our future be free markets and individual choice, or will it be, "Comrade, it has been noticed by the Ministry of Healthcare Cost Control that you frequently eat ice cream after 9pm. Surely you know, Comrade, that this kind of reckless behavior costs the taxpayers millions of dollars a year in medical expenses, that could be used to feed a hungry child, or pay the college tuition of a disadvantaged youth..." We'll have a pretty good idea on November 3rd. The end of the monsoon season and the resulting calmer waters signal the beginning of the most dangerous period for ships traveling the Gulf of Aden and Indian Ocean. Nearly half the 47 ships hijacked off Somalia last year were taken in March and April. Cmdr. John Harbour of the European Union Naval Force said a spike in attacks was very likely in coming weeks. But this season, ship owners and sailors are more prepared to try to evade pirates, fight back, or have armed security onboard, raising the likelihood of violence. Ships arming to fight pirates? What does this accomplish, other than to perpetuate the cycle of violence? Instead of imitating the American Cowboy types, like those Navy Seal snipers, Europeans should take a lesson from American Universities and declare their ships as GUN-FREE ZONES. Problem solved. Evidently, the gunman could not read the “GUN-FREE ZONE” signs at the campus entrance. The message of Massachusetts voters to Barack Obama could be summed up in two words: YOU LIE ! Babe of the Year goes, hands down, to Sarah Palin. Palin had many critics and made many supporters cringe, when she resigned the Governorship of Alaska, but at this stage of the game, the move looks both good and original (originality is always captivating, but it's especially welcome after two years of listening to Barack Obama regurgitate the well-learned nostrums of his many Leftist mentors), as Palin's name recognition and brand identity have become the envy of Fortune 500 marketers. So, John McCain played Porter Waggoner to Sarah's Dolly Parton. i.e. once the old guy had escorted her to the stage, she didn't need his help anymore to get noticed. In both cases, the success is due to a combination of form and substance. Sarah isn't merely vivacious, and she isn't merely Reaganite, she is us! i.e. she's Middle-Class America, so the connection -- or disconnection, in the case of elitists (and you elitists out there know who you are) -- is visceral. 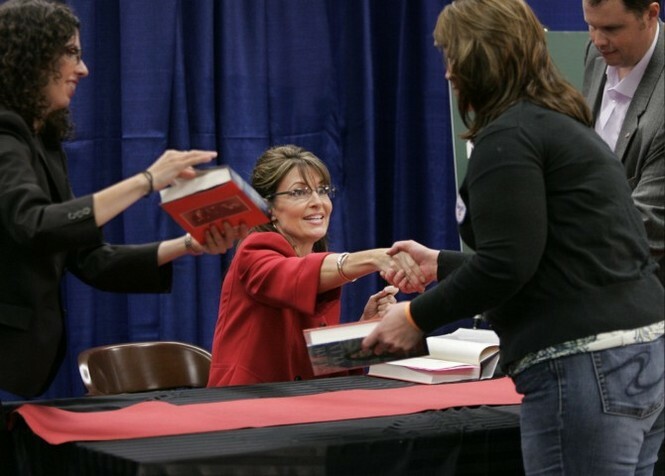 Sarah Palin has become a litmus test for faith in the common American man/woman, and at least during 2009, no other woman has captured our attention, for more than a moment, to the extent that Sarah has. That makes her 2009's Babe of the Year. Seriously, Obama has been the man of the year in 2009, nothwithstanding that his actions have been abominable. But you must admit, the guy has been inescapable in the national consciousness -- for cryin' out loud, little Johnny and Janie can't even get through day one of Kindergarten without a televised visit from Uncle Barry. The damage that Obama has done to law, liberty and prosperity and national power in America, while the Earth has been taking a single turn around the Sun, will take decades to undo, if it can be undone at all, and if anyone has the vision and the fortitude to try. In my book, that makes Obama Man of the Year, as well as Disgrace of the Year. Now this is Change We Can Believe In. Some Americans are worried that Enemy Combatants held at GITMO will not receive justice before U.S. Military Tribunals, while other Americans fear that bringing KSM and other Al Qaeda terrorists into the U.S. to stand trial in civilian court will endanger our people's lives, publicly embarass the United States, compromise critical intelligence in the War on Terror, provide a world-wide podium for Jihadist rantings, demoralize our military and intelligence services, and risk acquittal due to procedural technicalities. President Obama and Attorney General Eric Holder have Hopeful news for both camps. For those fretting "civil libertarians" Obama promises KSM a fair trial, and for those worrying "national security-ists" Obama promises KSM a fair hangin'. What else to make of both Holder and Obama assuring skeptics that a civilian court trial will not lead to acquittal? I just heard a report that President Obama ACCEPTED the Nobel Peace Prize. Barack Obama is not merely a con-man, he is a megalomaniac con-man. The crucial difference being that the former does not believe his own propaganda, while the latter is blissfully unsuspecting of the disproportionately short distance between messiah and laughingstock. Democrats like their Generals docile, unless of course those Generals are voicing disagreement with Bush policies (see McCaffery, Barry, et al). Democrats think that Generals should enjoy limitless tenure, provided they were appointed by Bill Clinton and disagree with Don Rumsfeld's vision (see Shinseki, Eric). Democrats think that a man's history of military service puts him above reproach and criticism (see Kerry, John F.), unless he is implementing a strategy to carry out a George W. Bush policy (see Petraeus, David, aka "General Betray-Us," see also Clinton, Senator Hillary R. "willing suspension of disbelief"). Democrats believe that any General's wisdom on matters military is always superior to that of the Commander in Chief (see Clark, Wesley), unless that General disagrees with CIC Obama (see McCrystal, Stanley). Once you understand these simple axioms you won't be so confused when you watch the news. Are you old enough remember the Neutron Bomb? It was a battlefield artillery shell that employed low-grade radioactivity to offset the numerical advantage of Soviet Bloc troops to NATO forces in Central Europe. American technology designed to give the good guys an advantage in The Cold War. The Neutron "Bomb" was never deployed because a successful marketing campaign by Soviet Disinformatzia dubbed it as "the ultimate Capitalist weapon: it kills people, but leaves buildings standing." The craven Jimmy Carter withdrew plans to deploy the neutron artillery shell, succumbing to the PR pressure, initiated by America's mortal enemies without (i.e. USSR), and amplified by America's mortal enemies within (i.e. CBS, NBC, ABC, NY Times, AP). Champagn glasses could be heard clinking inside the Kremlin. Fast-forward three decades. The U.S. is set to deploy ballistic missile defenses in Poland and Czechoslovakia. American Technology that would offset the Russian nuclear threat to former subject nations, and the Iranian nuclear threat to all of Europe. President Obama cancels the program. What is the difference between Obama and Carter? Obama required no enemy propaganda campaign manufacturing the pressure to break his will. At least Jimmy Carter agonized before wimping out; Obama's unilateral disarmament was pro-active. Well, it may not be quite true to say that Obama was not subjected to a propaganda campaign by America's enemies before throwing away a technological advantage vital to U.S. interests. It's just that the enemy propaganda campaign didn't occur during Obama's presidency; instead Barack Obama has been subjected to a lifetime of anti-American propaganda: from his Indonesian schooling, to his Ivy League lobotomization, to Saul Alinsky's writings, to William Ayers sponsorship, to ACORN hyjinx, to Jeremiah Wright's rantings and Van Jones' ravings. For cutting the USA down to size by cancelling U.S. Missile Defense in Europe, Obama earns a Gold Star from his anti-American mentors. For all you Moderates who voted for Obama, how's that Hope-and-Change working out for you? President Obama is infamous for employing Straw Man tactics to win arguments, but as the Public has expressed its collective revulsion at his pet plan for a government takeover or the Healthcare/Insurance industry, Obama has modified the technique. Rather than his usual mischaracterization of opponents' policy positions, Obama now claims that his opponents have no policy positions. The sound byte of the day on the news is Obama complaining that American healthcare is in crisis and opponents of his Healthcare takeover have no solutions to offer. Not to put too fine a point on it, but Republicans in Congress and the George W. Bush Administration have been pushing serious healthcare reform for at least 15 years, but most of those reforms have been thwarted by Democrats, with the assistance of various GOP "Moderates." Republican proposals include Medical Liability Lawsuit Reform, Medical Savings Accounts, Insurance Portability, Interstate Commerce in Health Insurance, Individual Vouchers for Medicare Members (i.e. Medicare Advantage), full deductibility of health insurance purchased outside of employer group plans. Those are reforms I can think of off the top of my head. Is it conceivable that President -- and former U.S. Senator -- Obama is unaware of these Republican Healthcare Reform proposals? That is what one must believe in order to believe that Obama is not attempting to deliberately mislead the American People when he claims that opponents of Obamacare have no alternative solutions. Townhall meetings with angry citizens shouting at their elected representatives and government officials, because of policy proposals that these citizens perceive to threaten their liberty -- is this un-American? On the contrary, it is consummately American, and very heartening to those of us who have wondered whether any substantial vestige survives of The Spirit of '76 in modern America. The truth is that nothing could be more American than for free men to resist government inroads on liberty. Forget, if you wish, that just last year dissent was "the highest form of patriotism," and consider the appalled reaction of Washington elites to Commoners who lack the "civility" to defer to their Betters. The Liberal political and media elites chide the citizenry for excessive passion in opposition to a hated policy, but the Americans standing up with fierce passion to big-shot office holders are acting on flawless instinct. To respond to a frontal assault on liberty and limited government -- such as Obamacare presents -- with docility, or even civility, rather than with fury and defiance would be to cheaply value the blood-bought free republic we have received from our forefathers. The conduct of the town hall dissenters both honors and carries on the legacy of the patriots of the American Revolution.